My Blog post last night despairing that the sheer number of candidates in each Suffolk County Council division is likely to lead to the Tories winning by default has got me thinking. Rather than just accept that this is the result we have nearly a month to convince people to adopt a more pragmatic course of action and to rally the anti-Tory vote together. The aim is to ensure that the County Council elected is more reflective of the actual wishes of the Suffolk electorate and not an accident of our electoral system. 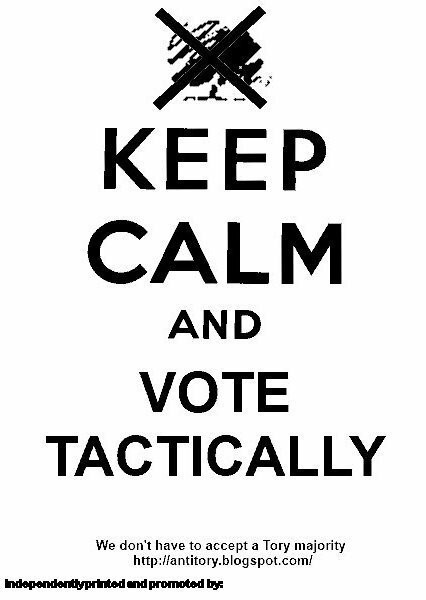 To do this we first need to decide which candidate is the most pragmatic tactical choice in each division. The idea is to produce a list that we publish on the web and make available for download and try and share as much as possible via social media. Hopefully we can also produce some posters like the one to the left here in the colour of the suggested tactical vote for target divisions or areas. To do this I need your help though! What I really need is some people to help to compile the list who have a good knowledge of the local areas and candidates. I can do this myself for much of Mid Suffolk and where the voting choice is more obvious in urban areas but I need your help for the rest of the county. To have any chance of making a difference the guide needs to be available soon, during the next week so if you can help in any way please get in touch via the Contact Form or email blog@hargrave.org.uk. Unless otherwise agreed all contributors can be assured of complete confidentiality although I would prefer you disclose your name to me. 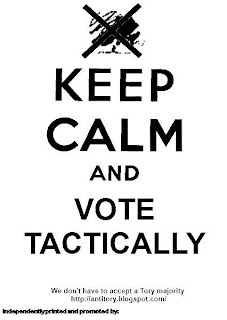 So KEEP CALM and VOTE TACTICALLY in Suffolk 2013!